A profile shows how you want to present yourself to your peers, classmates, and instructors. In your Illinois Compass 2g profile, you decide what you want to be called, share your academic interests, and more. When prompted, you must agree to the terms of service by checking the checkbox and clicking the Agree button before you can access any of the cloud profiles and social features for the first time. 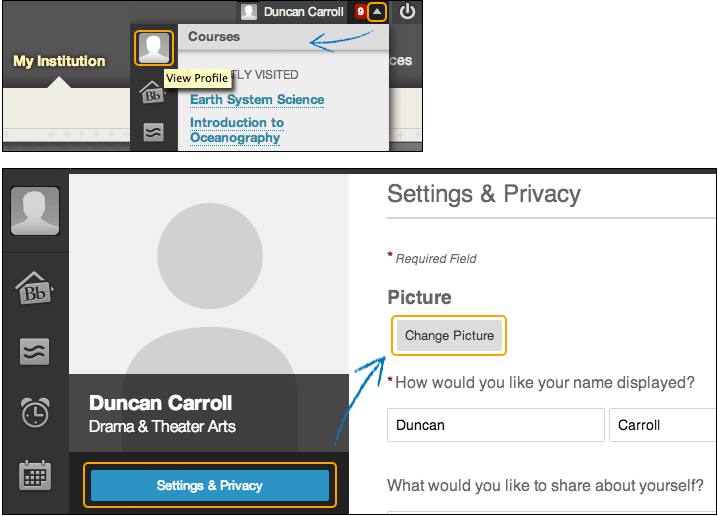 These features include Edit Profile, View Profile (your own or another user's), People, Messages, and Spaces; the terms of service contract is between you and Blackboard, Inc., the vendor behind Illinois Compass 2g. Our campus also includes a policy statement on the student code. When you first set up your profile, you're automatically prompted to provide a primary email. Make sure to use a personal email address in your profile. The system sends a verification email. After you verify that you're the owner of the email address, your profile is linked to that email address. You can upload a profile picture that appears throughout Compass. Your personal image appears in the page header, people tool, blogs, journals, discussions, wikis, and roster. Your profile picture also appears in the notifications modules, such as What's New. The modules may appear on the My Institution tab or on a course's home page.